A little while ago AndrewJ from Australia contacted me to extol the virtues of the Pentel Forte Pro II and ask if I had plans to review it. I replied it wasn’t really on my radar at the moment, but perhaps he would like to do a guest review…and so without further ado, here’s Andrew’s review. A while ago I had a fleeting flirtation with LED flashlights (or “torches” as they are called in Australia). I would visit flashlight message boards on the internet, enjoying the exotic jargon of collectors as they discussed topics such as lumens, twisty versus clicky switches, barrel knurling, runtimes, spill and so on. The most interesting posts were those from collectors trying to identify that one specific flashlight that would meet all their illumination needs under all conditions - the search for the holy grail, the “EDC”, the Every Day Carry. That one flashlight that they could always carry with them. And so it is with mechanical pencils. If you had to choose, what would be that one mechanical pencil you carried with you always? It’s not that I set out to deliberately collect pencils; it’s just the modestly large number that I’ve accumulated in my quest for my own EDC-MP. 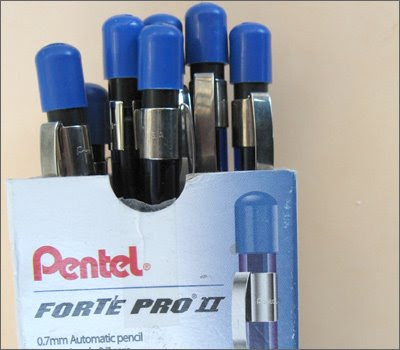 I can now confidently say I may have found it: the Pentel Forte Pro II. The Forte Pro is a nice-looking and comfortable pencil. 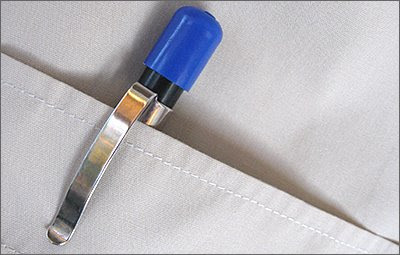 Its barrel colour is the deepest, translucent blue I have ever seen in a pencil, so it looks good in the hand as well as in the shirt pocket. The barrel marking, in silver ink, is “0.7mm Forte Pro II Pentel A77”. (More’s the pity, then, that the writing wears off much sooner than it should.) The sturdy silver spring clip bears the inscription “Pentel” on one side, “USA” on the other. The push-top cap makes a statement - it’s a big cap! To some it may appear out of proportion to the size of the barrel, but its shape and dimensions gives it a distinctive look. I’ve had two consignments of the Forte Pro from overseas and have noticed a slight design variation. One version of the cap has a completely solid dome while the other version sports two cut-out slots (maybe designed as cooling vents for the over-enthusiastic eraser user?). 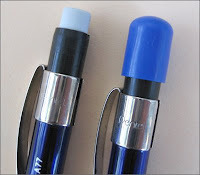 For those not employing my Blu Tack modification, under the cap is the PDE-1 large refill eraser with a length of 12mm. 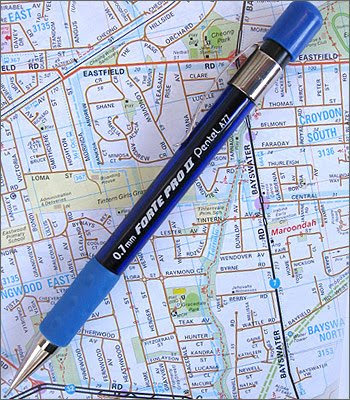 The lead capacity of the Forte Pro II was the feature that made up my mind to award this pencil my coveted EDC status. 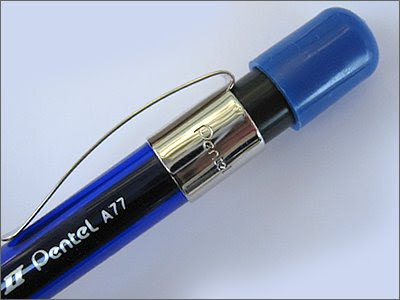 The larger-than-normal internal barrel space is claimed on Pentel’s website to store more leads than “standard” automatic pencils, whatever the capacity a standard automatic pencil might be. I can store fifteen .7mm leads in the Forte Pro. For .9mm users, the figure drops to eight, while .5mm users the capacity increases to 25. For those who can manage using a .3mm pencil, an astonishing 35 leads can be stored - fill up your pencil on New Year’s Day and you’re good to go for the entire year! 1: The lead storage of the Forte Pro II is a feature that Pentel emphasise. Yard-O-Led take their name from being able to store a yard (914mm) of 1.18mm lead in the pencil. The Forte Pro II can’t compete with that in the larger lead sizes, but if you use the 0.5mm pencil with standard 60mm long sticks, that’s 25 x 60 = 1500mm of lead, so a Yard-And-A-Half-O-Led. That’s an awful lot of writing and drawing. 2: All photos were supplied by Andrew. 3: I’d just remind you of the Made in USA status of the Fortes. The Forte Pro II has two cousins, the Forte and the Forte Pro. Below are a few notes on them and their differences to the Pro II. Just to be clear, this stuff is mine rather than Andrew’s. The Forte Pro and Forte Pro II are very similar. The only real difference that I can see is the lead storage area. With the Pro II you pull the top cap off and then the eraser, to access the lead storage chamber. Basically the whole barrel is the chamber thus allowing a lot of leads to be stored inside. With the Pro the whole end section comes off at the pocket clip to reveal a narrow diameter thin plastic tube inside as the lead storage chamber. Only a couple of leads fit inside it. The top section push fits onto the storage tube, and probably becomes loose over a long period of time. Apart from that, I think they are identical, except for colour schemes, etc. Photo: Pro and Pro II showing different access to lead storage magazine. The Forte is a little more different to its cousins. Rather than a rubber grip, the grip is part of the barrel moulding. Its grooved and no prize for guessing I personally prefer it to the rubber grips. The lead chamber system is the same as the Pro. The Forte doesn’t have an eraser cap. So, you start with the Forte. You replace the plastic grip with a rubber grip, stick a cap on the eraser and you have the Forte Pro. You take your Forte Pro and modify the top section and lead storage chamber and you have the Pro II. Clear? A very readable and enjoyable review. I would probably have passed on this pencil, had I ever seen one at retail. But now, I'll be on the lookout. What an enthusiastic review, with some excellent and compelling photos. I really like those maps as the background. Well done. Germ, appreciate your view. I have no personal experience with this pencil, and have never seen one, but the enthusiastic review from Andrew/Dave does motivate me to at least try it. Another advantage of the Forte Pro II is that it comes in 0.3mm lead size whereas the others don't. I have the same gripe as Dave in that I don't like the rubber grip. The A55 grip feels so much more comfortable to me. I've never seen one of these in America. I'd love to try one though...anytime I see a new review I just want to try it myself. The grip looks pretty comfy. And the wavy shape of the clip is pretty. The metal parts of the pencil are tastefully placed. okay im going to ebay now. btw, Dave, do you get most of your collectible pencils from ebay? I have the Forte II in red, 0.7 mm, but I don't care for the grip. The regular Forte is my "EDC" as you put it. I am not concerned about 'pocket safe-ability' of a pencil, but I like the large exposed eraser (no cap on the Forte and I just tossed the onr to the Forte Pro II). Bravo on the great guest review. Now others can see what a great pencil they've been missing! Sorry guys, I give away any Forte that comes into my possesion. ugh... But it's cool that you like em. To each is own. Hi Fishsaysmoo - Actually eBay is not that big a source of stuff for me. A local auction site would be my biggest single source, then friendly overseas folk, lots of different online retailers, eBay etc. Hi kiwi, I'm a new pencil enthousiast and I have had great pleasure reading your blog all summer. I currently use pentels P205 and P209 for my everyday writing and drawing, and I have a Caran d'ache Metal series pencil. I also have some other pencils that I used when I don't have my pentels on hand and I carry a steadler mars micro with me to write whatever goes trough my mind at any given time. 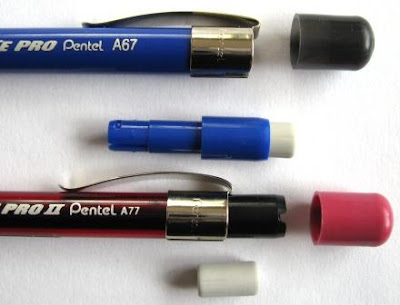 I was wondering if the pentel fort is the same as the pentel 120 series. They look very much alike. I have never seen a forte in real life, but I see the 120 series everywhere. Thanks, looking forward for your answer. Keep on the great bloging. Welcome Jean-Bernard. Thanks for your kind comments. The 120 A3 is known as the Sensi Grip to Pentel USA. You can see it on their website along with the various Fortes, so although similar it is a different model. The Pentel Forte series are the best mechanical pencils I have used. Out of all the ones I tried at work and what I have purchased over the years, these are the best. Unfortunately, they are hard to get - not available at Walmart, most drug stores, and office supply stores in my area. It seems everyone likes the most colorful and fancy looking ones rather than the best functioning one. I'll be ordering a few online since I damaged the one I have by dropping it on it's tip on a tile floor. By the way, my favorite pen is the Pilot EasyTouch - the ink flows nicely. hi i am new to your website hear dave. but i have seen you do many good reviews. 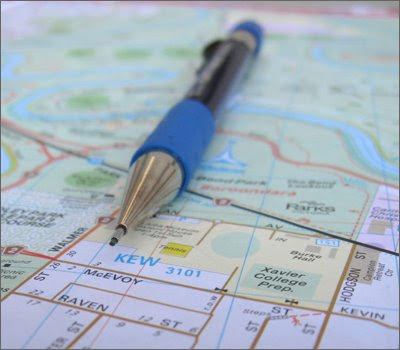 i also have just bought a pentel forte pro, i am begening to belive that it will become my every day carry pencil. i like how unlike other mancainle pencils, which only hold like about 2 pices of lead, this the Pentel Forte Pro 2 0.7 mm holds 15 pices of lead. it is also a very stong pencil and just like you said on your review, each click gives you the right amount of lead. every time i get a new pen or pencil, this is allway,s the 1st website that i go to to read review,s of my pencil,s. i hope you will enjoy useing your Pentel Forte Pro 2 pencil as much as i will enjoy useing mine. !! !keep up the good work!!! well, my ticonderoga sensematic broke today (9-30-2009). and dave, another pencil you may want to check out, is the staedtler 925 05 pencil. i noticed that you said the 0.3 forte pro 2 can hold 35 pices of lead. but i foud the stadeler 925 05, can hold 36 pices of 0.5 lead. so i am sory to say, but i have the stadetler 925 05 pencil as my every day pencil, and i am going to keep the pentel forte pro 2 as as my backup pencil. !keep up the good reviews! hey Dave, i was wrong when i said the Staedtler 925 05 holds 36 pieces of lead. i looked at my Staedtler 925 05 today, and i found it can only hold 25 pieces of lead. but as you said on the review of the Pentle forte pro 2, if you use 25 pieces of the 60mm lead, you get a yard and a half of lead which is a lot of lead to wright with. i have no problem with rubber grips, but another reason why i like the Staedtler 925 05, is because it has the lead degree indicator on it. so if you haven't already you may want to check it out! If you remove a regular wood case pencil eraser take a pliers and slightly smash a regular pencil eraser on a wood case pencil it will fit inside a Forte pencil so you have cheap replacements. I think this also works for Quicker clicker erasers some artist told me a few years back. I just bought a .3mm Forte Pro II and it seems nice enough except I'm very disappointed because the lead at the tip is not secured with a tight fit, so when drawing or writing it jiggles around in the sleeve and is very irksome. This may be a defect in the one I purchased however. I got my hands on a bunch of Forte Pro IIs they are just as good as the non rubber grip one. Been using Pilot Eno lead on bristol board I find it to be my favorite pencil currently even beating out the pentel kerry. The Eno lead makes it really smooth and slick though. 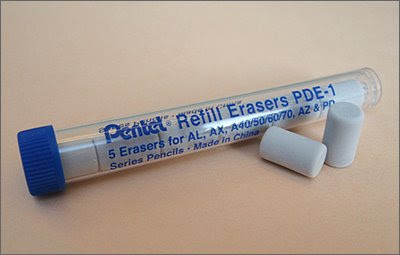 With the basic Forte and with some other pencils that use a separate tube for lead storage, you can store a significant quantity of spare leads in the area surrounding the lead tube. However, in some other lead tube models, this may interfere with the mechanism. Therefore, even the basic Forte can hold a lot of leads as long as you're willing to go through the extra trouble. OK, got my forte Pro IIs. In my opinion they are just as good as the P207s. Maybe better. They have a bit more heft to them, 3 grams to be exact, and a real eraser. Those P207 erasers are a joke! The tip is 3mm vs 4 mm. I notice no difference, but I am no expert, and I am not drafting. The grip is a downfall. It is not real sticky, and slides a bit on the barrel. I tried a grip from an Icy and it is perfect, but looks funny. Black would be cool. I'll keep my eyes open for some discarded pencils to harvest the grips. For $1.50 each, best deal I've seen. Do I need 24? Probably not. All I saw at Stapels.com was the regular Forte. I like the cap on the eraser. Seems like the Icy and the Forte may have the same barrel. Fort has a smaller eraser tip making it look like a professional pencil, not a toy. I bet the tips are interchangeable. Icy is transparent plastic tip. Fort is silver plastic that looks like metal. Same performance as an Icy so far. I like the fixed tip. Less wobble. The guts are metal unlike the plastic Icy tips. These seem real good. That's a cool idea. I bet the Forte looks better with a different cap. I know technicick is a well reviewed item. I don't own one yet. I pick up discarded pencils at the school I work in and scavenge clips and grips. Never know when they will come in handy. Well, it gives the pencil a "Darth Vader" makeover. I ordered a 4 pack of original Fortes from Staples just for the heck of it. They are sort of a mix of a Pentel 200 series and the other popular Pentels pencils with bigger erasers. They are inexpensive. About $7 for 4. The grip is like the P 200 but a little bigger. Not as pretty as the Forte Pro II but probably just as functional. As stated in the review, the lead tube is small. Do you really need to load 25 sticks of lead? The shorter tip (3mm) may be less prone to damage and still offer the fixed lead sleave that I would never be with out. Compared to the cheap pencils out there, why would anyone not opt for something like this. I think the market has been driven by kids who want a more colorful look, fancy clickers, colorful grips, and don't think about quality. Seems like the Pentel fixed sleaves are all good, even the plastic Icy type. I'm waiting for a Graphgear 1000. I have a funny feeling I wont like the non fixed sleave. I hope I am wrong. Note that if you use the Techniclick cap on the Forte Pro II, you must use the metal "grommet" supplied with the PDE-1 erasers. Of course, you can keep reusing this part when you replace the erasers, so this does not present much of a problem. I didn't realize that this was necessary when I posted this modification originally, but the mechanism won't work correctly otherwise. I actually found this pencil at a dollar store. Id say that it's the best dollar that I have spent in a long time! I use this pencil mainly for drawing and the control and feel is great. I went back to that dollar store to see if they had anymore of this pencil but sadly they did not. So, I think I will have to order some off of the internet if I can find them. Of course, the Forte does not get recognized by the pencil cognoscenti like the P20x line does. Oh well. I believe the two holes in the second version of the cap are a safety feature if a baby/toddler swallows the cap. Not a completely blocked air space.